But this week I want to talk about some of the most anticipated books of the upcoming year. Some are long-awaited sequels or new installments in well-loved series. Some are new ventures for favorite authors. And some are by debut authors. So, buckle up and and get ready to add to your wish list. And just a reminder – before you scramble for a pen and paper. You can find every book mentioned here AND a picture of the available covers AND a link to pre-order them right through the Books Between Podcast link at AlltheWonders.com. I’ve got your back, I know you’re busy, so it’s all right there for you. And I’ve come to really love pre-ordering – it helps out favorite authors and it’s like a little gift to your future self. And second – publication dates do change, so while I’ve mentioned the book release month – things sometimes change. All right – let’s get to it! Let’s start with the some sequels because there are some AWESOME sequels coming our way to give us something to look forward to during this dreary month…. Linda William’s Jackson’s follow-up to Midnight Without a Moon – A Sky Full of Stars is out this January as Rose struggles with the way to face the rising racial tensions in her community. Ooooo – and the new Fenway & Hattie is out this January!!! I just can’t get enough of that little dog! This third one is called Up to New Tricks so definitely snag that one for your Fenway fans – and for you, too! And Gordon Korman’s Supergifted is also set for a January release – this is the sequel to Ungifted – a great book about a boy named Donovan who is mistakenly transfering into a gifted program and has to figure out how to pass as brilliant. This follow up is about his new friend, Noah. We are also getting another Terrible Two book in January – Terrible Two Go Wild! And a new Spy on History book – Victor Dowd and the World War II Ghost Army! Ah! And we a get a new HiLo book this January! It’s called Waking the Monsters! (As my husband said – yeah, that sounds like what I do every weekday.) Our 8 year old is SUPER psyched about this new book! – so keep ‘em coming Judd Winick! Okay – and it’s not really a sequel BUT – there is just released a GRAPHIC NOVEL version of the first The Wings of Fire book – ahhhh!!! It’s illustrated by Mike Holmes and my students are going to FREAK when I tell them tomorrow. Some other January releases that are looking fabulous are…. Winterhouse by debut author Ben Guterson – this is an urban fantasy mystery set in a magical hotel containing a huge library with secrets to discover. We are also getting the first middle grade book by picture book author Angela Dominguez called Stella Diaz Has Something to Say! Another novel that looks REALLY interesting is called TBH, This is SO Awkward by Lisa Greenwald and it’s told entirely in texts. So I definitely need to check that one out. And my friend Emily Montjoy has been raving about Just Like Jackie by Lindsey Stoddard so I’m looking forward to my turn with that one. Also – Leslie Connor, the author of the critically-acclaimed All Rise for the Honorable Perry T. Cook, has a new novel out in January called The Truth as Told By Mason Butte – so definitely check that one out. Annnd – the new Elly Swartz novel – Smart Cookie!! I had a chance to read an ARC of this one with my daughters and oh I can’t wait for it to be out in the world! One that I’ve had a chance to read ahead of time is Playing Atari with Saddam Hussein by Jennifer Roy and Ali Fadhil. I’ll talk more about this book later when I have time to really go into depth, but for now I’ll just say – preorder it. A great historical fiction about an Iraqi boy during the first Gulf War. Then we have The Serpent’s Secret by Sayantani DasGupta – a fantasy about a New Jersey girl discovering that she may, in fact, be an Indian princess. The 11:11 Wish by Kim Tomsic looks really fun. It’s about a dorky math nerd who vows to reinvent herself at her new school. And when she makes a wish as the clock strikes 11:11, she gets granted a magical object that might help her. Shannon Hitchcock, author of Ruby Lee & Me has a new novel coming out in February – this one is call One True Way. Another one to look out for in February is Becoming Madeleine: A Biography of the Author of A Wrinkle in Time by Her Granddaughters. With all the buzz about Wrinkle in Time with the new movie coming out, this book looks really great. Aaand – we get a new John David Anderson novel in February!! This one (Granted) is so different from Ms. Bixby or Posted, but I just loved it! It’s a fantasy novel about a fierce fairy named Ophelia Delphinium Fidgets who runs into some trouble as she attempts to grant her first wish. In March, there are so books I am really looking forward to! My principal won’t mind if a take a month-long reading sabbatical, right? Like Vanessa is the debut novel by author Tami Charles – it’s set in 1983 and is about a young girl inspired by seeing Vanessa Williams get crowned Miss America and is encouraged by her teacher to enter a beauty pageant. Lauren Magaziner has a new book out in March called Wizardmatch that looks like a fun fantasy. And The Science of Breakable Things by debut author Tae Keller looks really good – a book about a scientifically minded girl competing in an egg-drop contest AND using those skills to try to help her mom deal with her struggles. In March we also get Colby Sharp’s Creativity Project! An “awesometastic” collection of short stories developed from the author’s prompts to each other. It is a fantastic read and such a clever idea! Definitely one that teachers will want on hand to spark your writers’ imaginations. The Train of Lost Things by Ammi Joan-Paquette is another favorite of my #BookVoyage friend Emily Montjoy – who has amazing taste by the way. (Definitely go follow her on Twitter @mrsmontjoyreads ! ) So I’m looking forward to a chance to read this one as well. Oh! And the next Dan Gemeinhart novel comes out in March!! It is called Good Dog and I can’t read the synopsis to you or I’ll start crying but it sounds simply wonderful. Of course it is – it’s Dan Gemeinhart! March lets us reconnect with some favorite characters with a great bunch of sequels coming out. We get a new Emily Windsnap book, Emily Windsnap and the Falls of Forgotten Island. The third Narwhal and Jelly book (Peanut Butter and Jelly) come out. The 78-Story Treehouse as well as a new Dory Fantasmagory book called Head in the Clouds along with a new Stick Dog Stick Dog Crashes a Party. And – probably the book that I have been waiting and waiting for. DYING to read with my daughters – is The Wild Robot Escapes – the sequel to Peter Brown’s incredible The Wild Robot! So – mark your calendars for March 13th, pre-order this one, AND – if you haven’t yet read the first one…. well, what’s the matter with you? Get on that! The next Moon Base Alpha book called Waste of Space, Janet Tashjian’s My Life As a YouTuber , and Jasmine Toguchi, Drummer Girl will be out. And Adrienne’s Kress’ second Explorers book – The Reckless Rescue! And the third book in Jason Reynold’s incredible Track series will be out! It’s called Sunny and follows “the chillest dude on the Defenders team”, but one with a troubled life at home that hides behind that sunny smile. And, the debut by Laurie Morrison and Cordelia Jenson, called Every Shiny Thing looks really really good…. I’m also looking forward to the new Jewell Parker Rhodes novel called Ghost Boys. It’s about a young boy who is killed by the police when they mistake his toy gun for the real thing. And as a ghost, he witnesses how that event unfolds in his neighborhood and meets other ghosts like Emmett Till. Oh that gives me chills just thinking about it! And – we get a new Kwame Alexander novel this year! It is called Rebound – the much-awaiting prequel to his Newbery-winning The Crossover. This one about Josh and Jordan’s father, Chuck Bell. Terri Libenson’s new graphic novel – Positively Izzy looks great- it’s the companion to Invisible Emmie. And the The Cobalt Prince, the second 5 Worlds graphic novel will be out. Another May release that I am so so excited about is Most Valuable Players – the next Phil Bildner Rip & Red book. There are three books coming in May that have been getting a lot buzz lately – one is called Bob – written by Wendy Mass and Rebecca Stead. I can’t wait to see the awesomeness THAT collaboration brings! The second one is Aisha Saeed’s middle-grade debut, Amal Unbound, which is about a Pakistani girl forced into working as an indentured servant to pay off her family’s debts. Friends who have read this one are saying it is incredible. Kate Messner’s new novel Breakout – based on some details from the real-life (and close to home for me) breakout of two prisoners in New York and how the community reacts to that situation. I can’t WAIT for this one!! Also – Kate Beasley (of Gertie’s Leap to Greatness) and Dan Santat (of a million books you love, most recently the picture book After the Fall) are teaming up for a book called Lions & Liars – about a boy named Frederick who is sent to a disciplinary camp for troublesome boys. That one looks phenomenal! And Laura Shovan’s new book Takedown is coming this June! Can’t wait to read this novel about a girl who wants to join the wrestling team. I keep hearing people raving about it on Twitter. And Barbara Dee has a new novel coming out in June called Everything I Know About You. We also get to read Wendy McLeod MacKnight’s new middle grade novel The Frame-up! I had a chance to read this one this past fall and it is phenomenal. It’s about a young artist who goes to live with his father for the summer and attends an art-camp at the museum where his father is the director. And he soon discovers that the paintings are alive! Truly – after reading this book, I’ll never look at another painting the same way again. It’s so so good! And thankfully I have July and August off from school, so I can catch up AND snag some summer release books such as…. And my daughter will be thrilled to know there will be a new Dog Man this summer called Lord of the Fleas! Oh! And Denis Markell, author of Click Here to Start has a new novel coming this summer called The Game Masters of Garden Place. Also this summer is a cool book called Marcus Vega Doesn’t Speak Spanish by Pablo Cartaya. Let me read you a blurb: “Marcus Vega is six feet tall, 180 pounds, and the owner of a premature mustache. When you look like this and you’re only in the eighth grade, you’re both a threat and a target.” And the rest of the description is so good – definitely check this one out. So after August, specific publication dates get a little harder to come by. BUT – a few things have popped up. Like.. The Vanderbeekers and the Hidden Garden!! A new Beatrice Zinker book! And I can’t wait for Jarrett Krosoczka’s graphic novel memoir coming out called Hey, Kiddo. Also – I saw, I think… a Sarah Weeks has a sequel to So B. It coming out called Soof? That is definitely on my radar! And the big news in my class this week – the 8th Amulet book!!!!!! Woohoo!!! Oh my gosh – my students cheered when I told them that Kazu Kibuishi announced this on Twitter last week! It is called Supernova and has a beautiful cover so go check that out and make all your middle grade readers happy by pre-ordering it now. So so much to look forward to this year! And of course – I’ll keep you posted about all the amazing books headed our way so we can stay up to date. And definitely make sure you check out the show notes and check out those links so you can dive deeper and discover awesome new books that you are looking forward to reading this year. 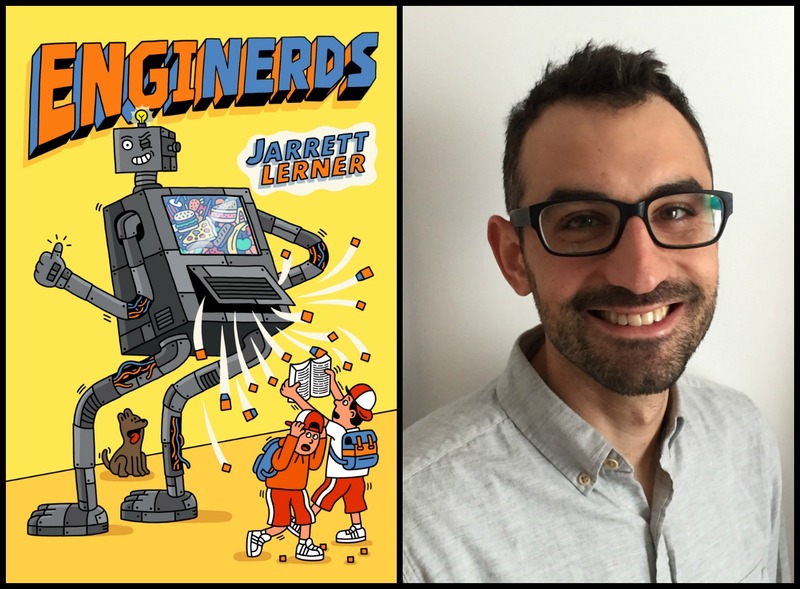 This week I am so excited to welcome to the show Jarrett Lerner – author of the fantastic middle grade novel EngiNerds. We chat about his plans for the sequel, the power of the perfect metaphor, and Project Runway! Enginerds has been getting all kinds of love lately – congratulations!! I saw Colby Sharp used Enginerds as his example in his 5 ways to support authors you love video. For those who aren’t (yet!) familiar with Enginerds, can you tell what this story is about? What was your thought process like when deciding what your robots would look like and act like? Enginerds is in a long and glorious line of children’s books and movies and TV shows featuring robots. We are getting a book two, right?! So I saw on Twitter last month that you have teamed up with Analiese Avery (@_AJAvery) to launch @MG_BookBot. How did that get started and what are your plans? And I am so excited about your new middle grade focused website – MG Book Village! Aside from the twitter hashtags, what are you hoping to include on the site? Tell me about your KidLit Mentorship Project…. One of the things I talk about a lot with other educators is the power of that one person to really influence a child’s reading life – either in a really positive way or sometimes in a negative way. Was there someone in your life who impacted you as a reader? Thank you so much for joining me this week. If you like the show, please subscribe on iTunes or tell a friend!